Large explosions were reported at a Syrian military air base early Sunday in an attack widely attributed to Israeli warplanes. However, Syria denied an attack had taken place. The reported strike occurred just after midnight at Mazzeh air base near Damascus, a key regime facility thought to have been targeted by Israel in the past. 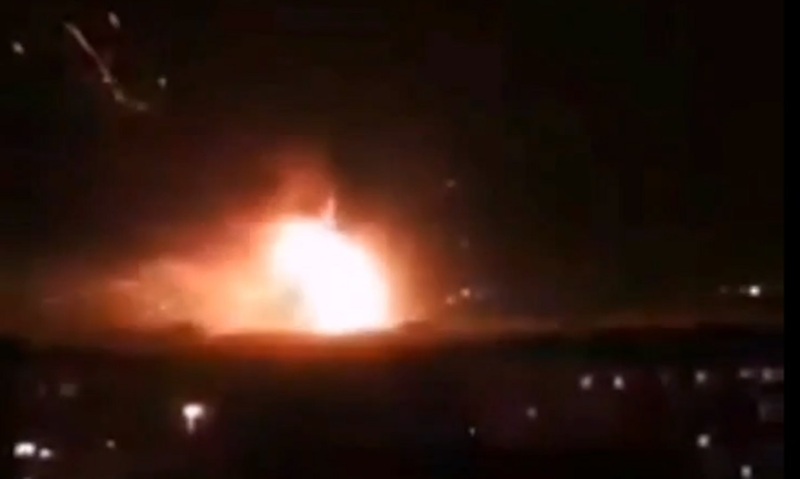 The military airport of Mazzeh, in the west suburbs of Damascus, was hit by a “possible Israeli missile, which hit a munitions store setting off successive explosions,” the head of the Syrian Observatory for Human Rights Rami Abdel Rahmane told AFP. The observatory also said there were casualties, according to reports. The Lebanese al-Meyadeen news outlet, seen as closely linked to Bashar Assad regime, claimed that the explosions were the result of an Israeli missile strike. Five missiles were reported to have targeted the air base. Eyewitnesses reported large blasts and pictures shared on social media showed large explosions, as well as what appeared to be air defense missiles streaking in the sky. However, Syria’s official SANA news outlet reported that the blasts were the result of a technical problem. “The explosions heard were due to an explosion at a munitions deposit close to the airport which was due to an electrical short circuit,” a Syrian military source said. A Syrian official had earlier said that the base was targeted by a missile strike. It claimed that missiles had been intercepted by Syria’s air defense systems. Israel generally does not comment on reports of strikes in Syria. The reported strike came as senior US officials from the State Department were in Israel to discuss Syria with Jerusalem officials. In January 2017, Syria accused Israel of launching missiles that hit the Mazzeh base, and threatened repercussions. Israeli missiles also reportedly targeted the base in late 2016. Officials in Jerusalem have said they take action to stop the transfer of advanced weapons to terror groups and to keep Iran from gaining a foothold in the country; Dozens of strikes inside Syria have been attributed to Israel. On Wednesday, Prime Minister Benjamin Netanyahu vowed that Israel would continue taking action against Iran and its proxies in Syria, and would not be affected by a defense cooperation agreement signed between Damascus and Tehran. This entry was posted on September 2, 2018 at 7:23 AM and is filed under Uncategorized. You can subscribe via RSS 2.0 feed to this post's comments. You can skip to the end and leave a response. Pinging is currently not allowed. They were just celebrating syrian national day at the base. Wake up Syria and stop fighting the one and only God and his firstborn Israel ! If you dont stop, you will lose everything, even your lives.